Frida Kahlo, the great Mexican artist, lived in a world of pain, and her anguish shows in her many self-portraits. And yet she embraced life. Her pain was both physical and emotional, and much of it shows in the Casa Azul, the house that Frida Kahlo shared with her husband the Mexican Muralist Diego Rivera, which has been turned into a museum. She wrote, “I suffered two grave accidents in my life, one in which a streetcar knocked me down … The other accident is Diego.” Her husband Diego Rivera was a notorius philanderer, running off with many women including her younger sister. The streetcar that knocked her down drove a iron handrail through her body damaging her spinal cord and fracturing many bones, further damage done to a body with a withered leg (from a bout of polio as a child) that was eventually amputated. An unfinished portrait of Frida Kahlo’s family tree. 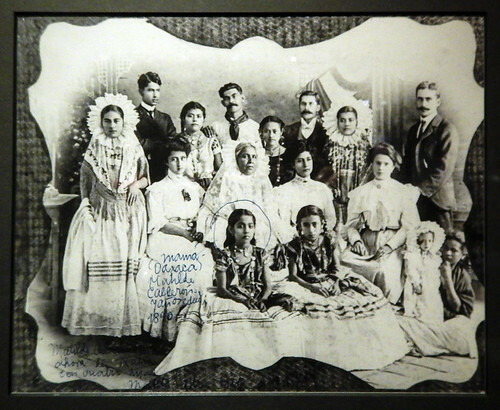 A portrait of her mother’s family, many wearing traditional Mexican clothes from the Oaxaca region of Mexico. Her mother Matilde is circled; two of the women in the back are wearing a lace ruff which surrounds their faces. 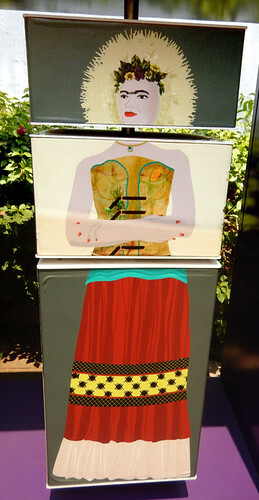 Frida embraced her Mexican identity and usually dressed in the traditional costumes from various regions around Mexico. This display in the museum demonstrates typical costume worn by Frida: the traditional lace ruff from Oaxaca, the body brace which at times she wore outside her clothing like a corset and a long skirt which she wore to hide her withered leg. 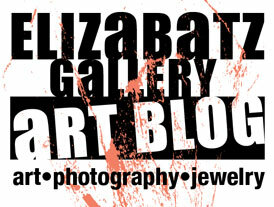 She is best known for her self-portraits where she depicted the pain of the world she lived in. The mirror which she used for her many self-portraits in her studio. 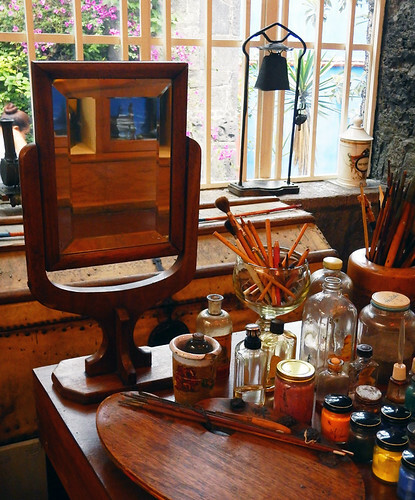 Frida’s studio in the Casa Azul with her paints, easel and wheelchair. 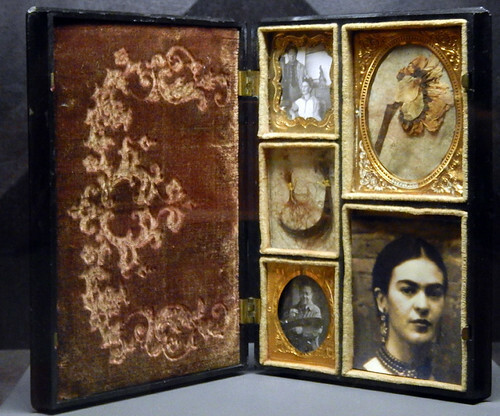 Portraits of Frida Kahlo and her husband, along with dried flowers and two locks of hair, displayed in a memory box. That Diego loved her in his own painful way shows in this note to her written two years after her death at age 47. Quote by Frida about the reason she paints so many self-portraits… ‘Casa Azul’, the cobalt blue house, was where the artist was born and spent most of her life. Diego Rivera, her on-again off-again husband inherited the house and in his will donated the house to a society with the idea that it would become a museum dedicated to Frida. More of Tourmaline’s One Word Photo Challenge: Portrait.